Pulse Width Modulation (PWM) is a technique widely used in modern switching circuit to control the amount of power given to the electrical device. This method simply switches ON and OFF the power supplied to the electrical device rapidly. The average amount of energy received by the electrical device is corresponding to the ON and OFF period (duty cycle); therefore by varying the ON period i.e. longer or shorter, we could easily control the amount of energy received by the electrical device. The Light Emitting Diode (LED) will respond to this pulse by dimming or brighten its light while the electrical motor will respond to this pulse by turning its rotor slow or fast. The PWM signal normally has a fixed frequency (period) with a duty cycle that could vary from 0% to 100%. Now you understand that by just adjusting the PWM duty cycle we could easily control the LED brightness or the electrical motor spinning speed. Today most of modern microcontroller has a build in PWM peripheral inside; this make generating PWM signal is become easy and straightforward, you could read more about non microcontroller PWM base generator on “The LM324 Quad Op-Amp Line Follower Robot with Pulse Width Modulation” article on this blog. 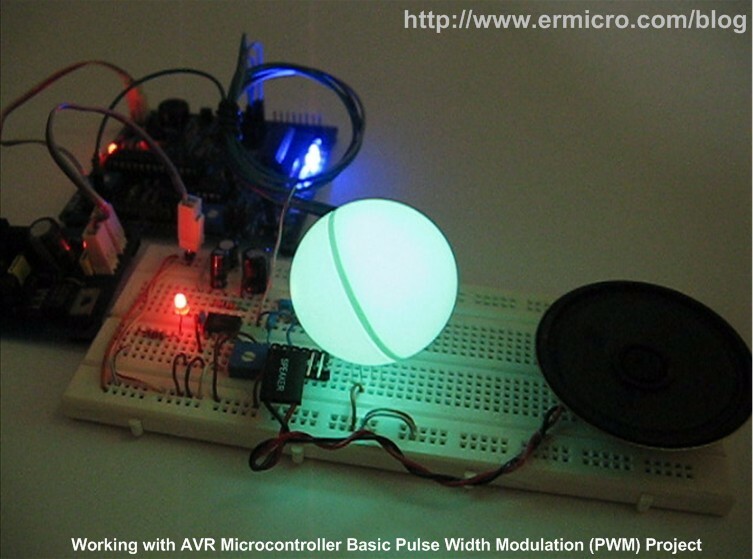 On this tutorial we are going to use Atmel AVR ATMega168 microcontroller which support up to 6 PWM output simultaneously and at the end of this tutorial we will take advantage of all the available PWM peripheral to make a nice RGB LED Light and Sound Show. Most of the microcontroller PWM peripheral depends on the TIMER peripheral to provide the PWM signals frequency. 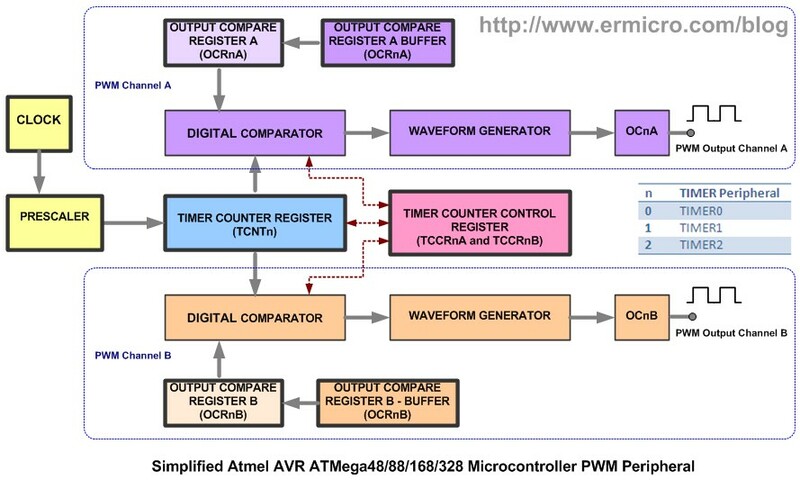 The PWM peripheral will use the TIMER counter register (TCNT) as a digital step-up /down and continuously compare to the pre-determine duty cycle register (OCR – output compare register) value. 13. 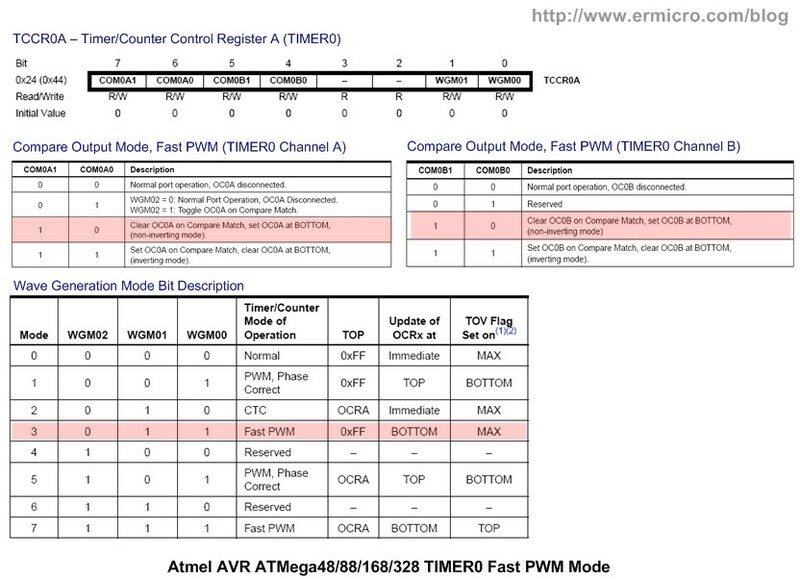 Atmel ATMega48/88/168/328 and LM386 datasheet. The AVR fast PWM mode could generate the most high frequency PWM waveform compared to the other two PWM modes (i.e. Phase Correct or Phase and Frequency Correct mode). This PWM mode simply uses the TIMER counter register (TCNTn, where n represent the TIMER 0, TIMER1, and TIMER2 respectively) incremental value which is start from 0x00 (BOTTOM) to 0xFF (8-bit TOP) or 0xFFFF (16-bit TOP). As shown on the diagram above, the behavior of output compare bit channel (OCnA or OCnB) output could be set to non-inverting (CLEAR and SET) or inverting (SET and CLEAR) mode by setting the compare match channel bit (COMnA1, COMnA0, COMnB1, and COMnB0) on Timer/Counter register A (TCCRnA). 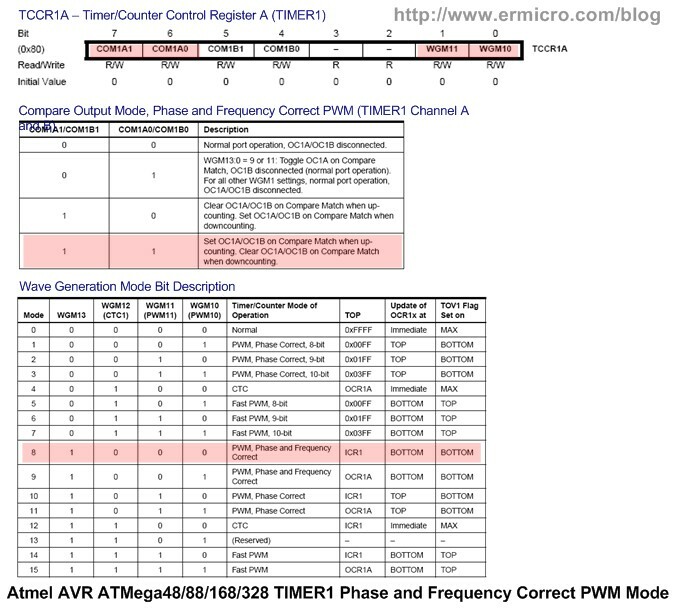 The Fast PWM mode could be set by setting the wave generation mode bit (WGM01 and WGM00) on Timer/Counter register A (TCCRnA) and WGM02 bit on TCCRnB register. When the TIMER counter register (TCNTn) equal to Output Compare Register (OCRnA or OCRnB) it will generate the Output Compare interrupt and when the TCNTn register reach TOP it will generate the TIMER overflow interrupt (TOV). 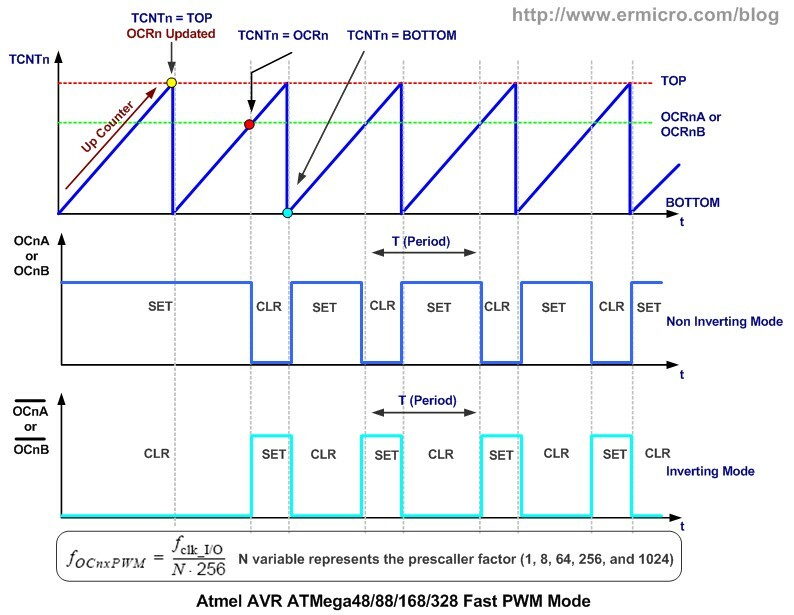 As you see at the Atmel AVR microcontroller PWM peripheral diagram above when we update the Output Compare Register (OCRnA and OCRnB) value, the value will be updated on the Output Compare Register Buffer first and when the TIMER0 Counter Register (TCNT0) reach TOP then the OCRn register will be updated with the OCRn buffer value and at the same time the Output Compare Bits (OCnA or OCnB) will be set. 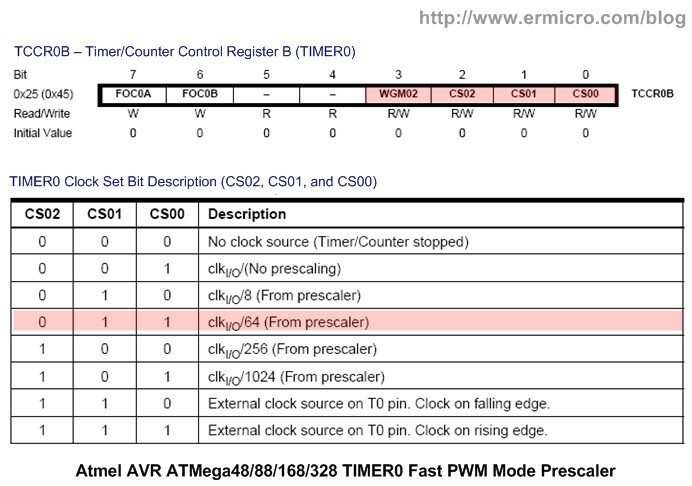 On this following C code, we are going to use TIMER0 Fast PWM mode on both channel A and channel B. You could freely choose or experiment with any PWM frequency that work best with the electrical devices that you want to control with the Fast PWM mode signal. This make the Fast PWM mode is not suitable when we want to use for controlling the motor speed precisely; therefore on our next discussion we will correct this shifted phase effect by using the AVR microcontroller Phase Correct PWM mode for generating the PWM signal. Now as you understand of how to use the Fast PWM mode on TIMER0, you could easily adapt this principal to TIMER1 (16-bit) and TIMER2 (8-bit). 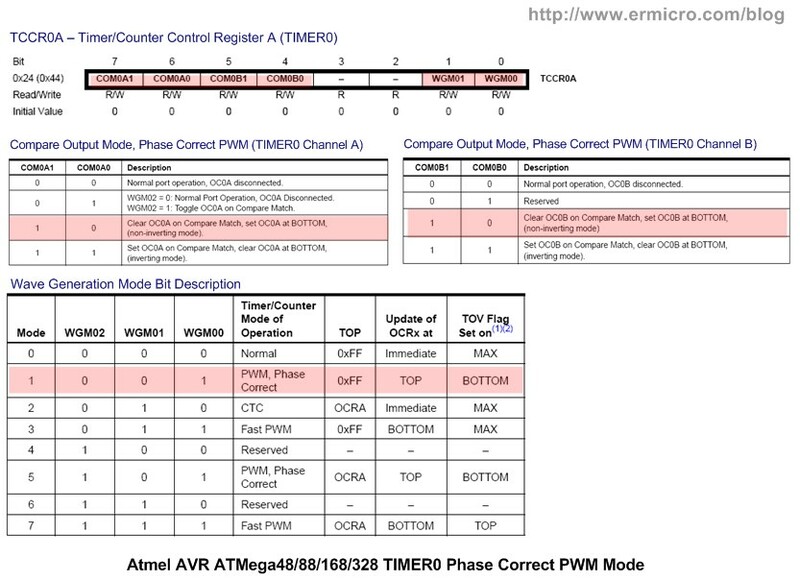 Please refer to the Atmel ATMega48/88/168/328 datasheet for complete information. On this following C code, we are going to use TIMER0 Phase Correct PWM mode on both channel A and channel B. 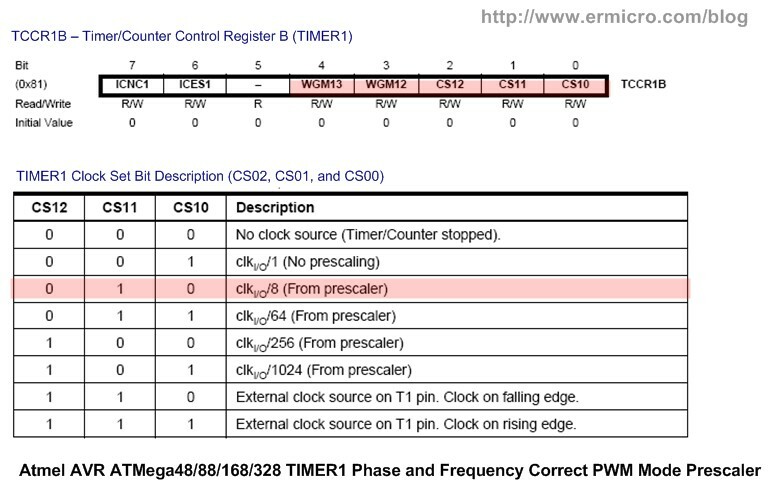 Again you could easily adapt this principal to TIMER1 (16-bit) and TIMER2 (8-bit) as well (please refer to Atmel ATMega48/88/168/328 datasheet for complete information). 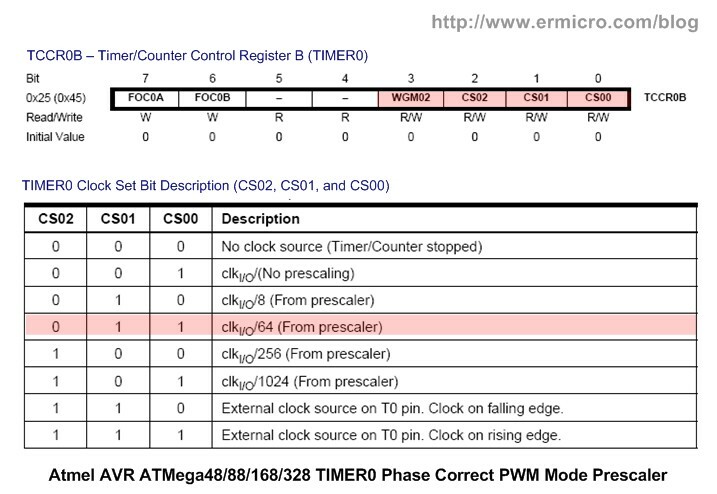 The Phase and Frequency Correct PWM Mode feature is only available on TIMER1 (16-bit). Basically the Phase and Frequency Correct PWM mode use the same dual slope technique used in Phase Correct PWM mode to generate the PWM signal. 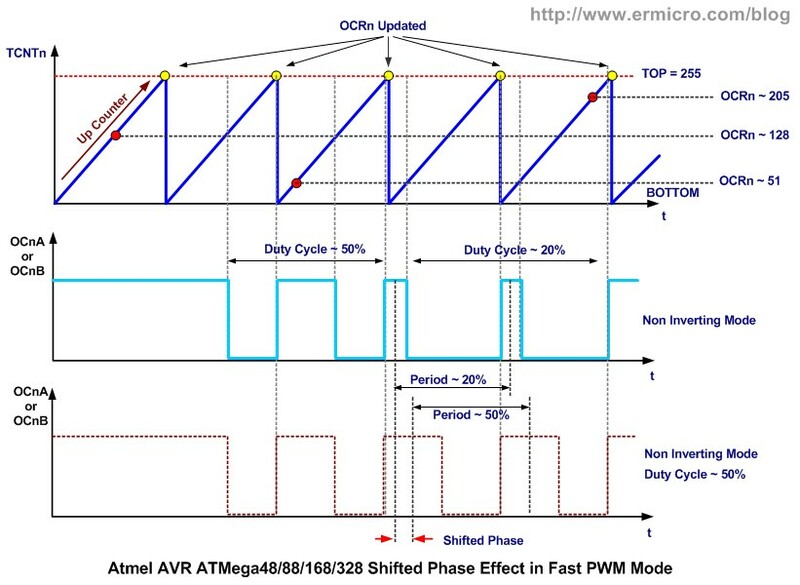 These two modes actually are identical if we never change the PWM signal frequency, but if we need to change the PWM signal frequency on fly, then we need to use the AVR ATMega168 microcontroller Phase and Frequency Correct mode to generate the PWM signal. 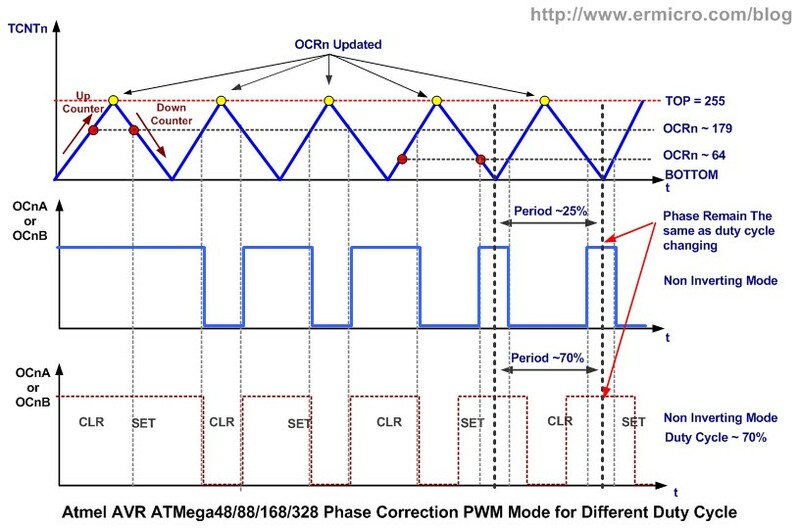 Differ from the Phase Correct PWM Mode, in Phase and Frequency Correct PWM Mode the Output Compare Register (OCRnA and OCRnB) is updated from the buffer when the Timer Counter Register (TCNTn) reaches BOTTOM instead of TOP in Phase Correct PWM Mode. 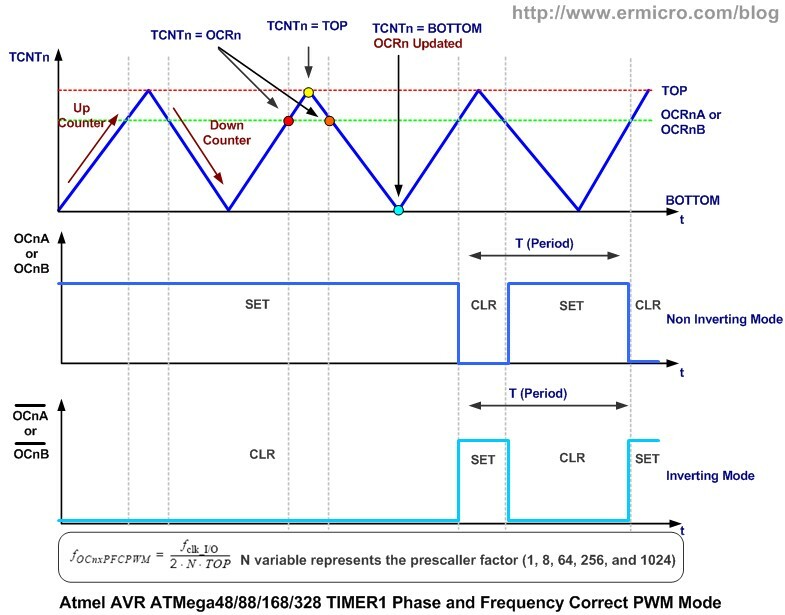 The frequency could be change by changing the TOP value, here you could understand why we need to use the Phase and Frequency Correct PWM mode, because as we change the frequency and at the same time the PWM peripheral update the Output Compare register (OCRnA and OCRnB) then there will be a glitch in the PWM frequency signal. In Phase and Frequency Correct PWM mode because the Output Compare Register is updated at the BOTTON therefore the rising and falling length of the PWM signal is always equal this result in frequency being corrected when we change the frequency on fly. Typically in controlling the electrical device with PWM signal we seldom change the PWM frequency on fly, therefore the common application for this mode is to generate the sound. On this following C code example I used the Phase and Frequency Correct PWM to generated tone. 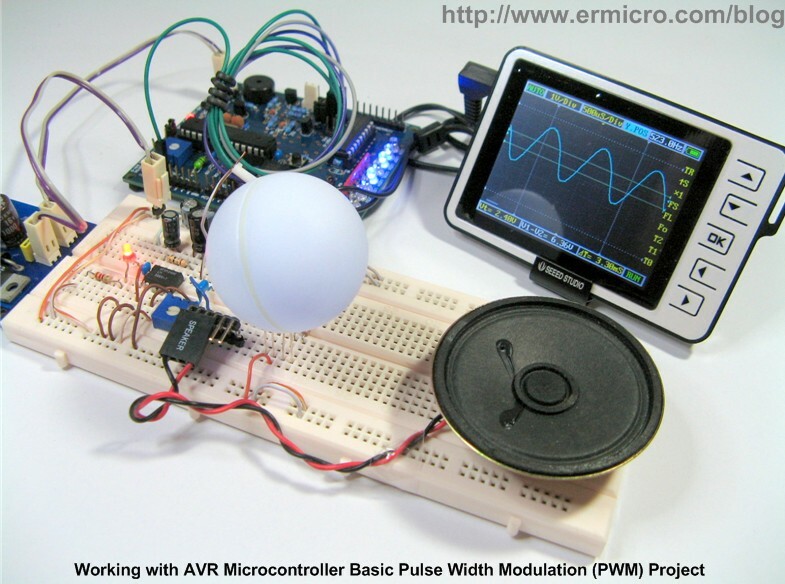 Another example of using this PWM mode could be read in “AVR Twinkle-Twinkle Song Using PWM Project” article on this blog. To generate a controllable tone, we need to produce the exact frequency on each notes, the notes frequency could be found at this website address http://www.phy.mtu.edu/~suits/notefreqs.html. In order to generate the C5 note we have to produce the PWM frequency of 523.23 Hz at 50% duty cycle. Therefore by setting the Wave Generation Mode Bits WGM13=1, WGM12=0, WGM11=0, and WGM10=0 respectively, we choose the TIMER1 Phase and Frequency Correct PWM mode which has TOP value set on TIMER1 Input Capture Registers ICR1H and ICR1L; the Pulse Width is set on TIMER1 Output Compare Registers OCR1A and OCR1B. 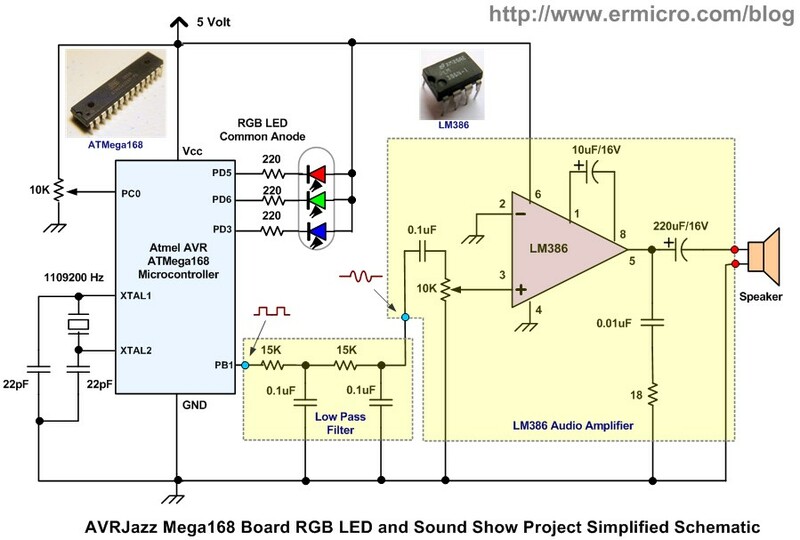 This RGB light and Sound show project used the well known LM386 linear amplifier IC from National Semiconductor which recently has been acquired by Texas Instrument (April 2011) to produce a quite loud sound from the TIMER1 Phase and Correct Frequency PWM mode through the speaker. The TIMER1 Output Compare Channel A (PB1) PWM signal is being passed through the passive low pass filter (is also called an integrator circuit for a non sinusoidal input signal such as square wave and triangle wave) in order to shape the square wave forms to become the sinusoidal wave forms before being amplified by the LM386 IC. From the C code above you could see that we use all the available AVR ATMega168 microcontroller PWM sources to drive both the RGB LED and at the same time playing “What a Wonderful World” song. By using the TIMER1 overflow interrupt (TOIE1=1 in TIMER1 interrupt mask register TIMSK1) we could display the RGB LED and at the same time playing the song notes. The RGB LED PWM duty cycle is achieved by assigning both random value and the 16-bit TIMER1 counter value (TCNT1H and TCNT1L) to the Output Compare Register (OCRn) in ISR(TIMER1_OVF_vect) function routine. With this method we could get the desired RGB LED light effect which is depend on the song notes. Of course you could experiment with other register value as well (e.g . ICR1H and ICR1L registers). 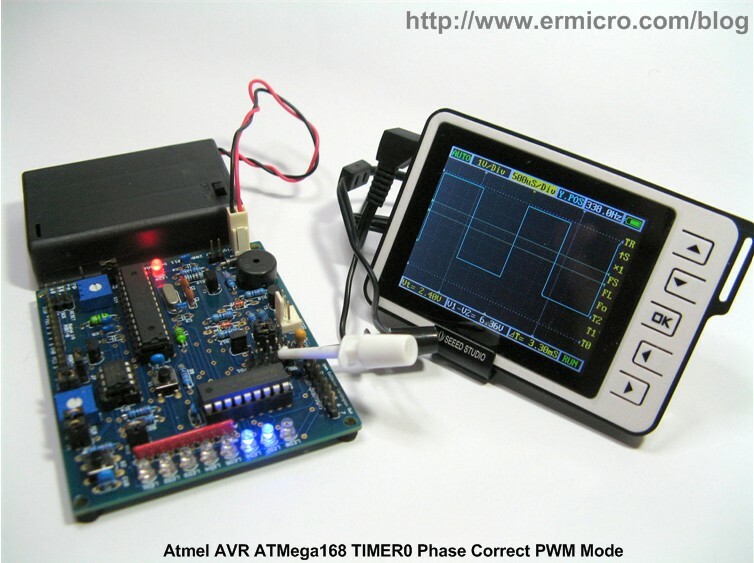 Knowing the basic working principal of the Atmel AVR microcontroller PWM peripheral is one of knowledge that should be learned by anyone who want to involve in the embedded world professionally or just as a hobbyists. 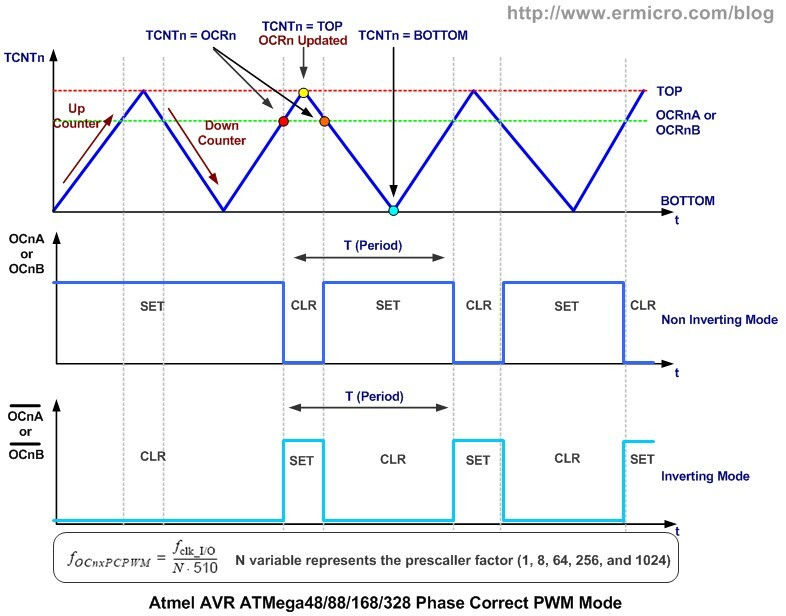 I hope this basic AVR PWM tutorial will give you a solid AVR PWM knowledge to be used in your next embedded project. Is it possible to make PWM output on non PWM output? 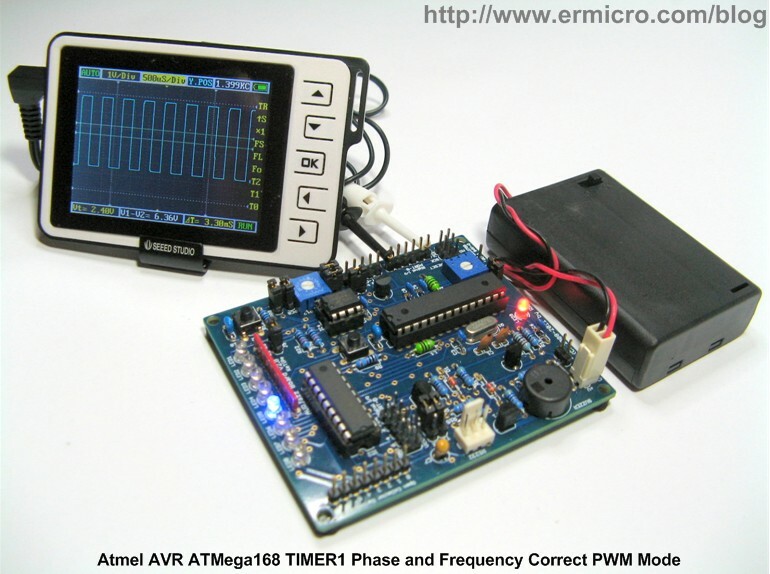 For example, I have ATMEGA8 which has three PWM channel, but I need 4 channel PWM on my project. Is it possible? I need your help. How to make PWM output with L293D motor DC on Atmega8 @4MHz external crystal. Because Atmega8 makes UART Serial RF RX/TX 433 MHz, but I got the RF RX/TX 433 MHz, it works. Please explain me about to make PWM output with 4MHz external crystal. I hope your answer soon. What a great project, I’ve just joined your blog. I’m doing my project about robot arm! Your blog is very great and have a lot of information for me to learn. Thank you very much! I have a question for you, would you please to answer me :-): How to precisely control servo motor (Futaba S3003) rotation using trimport (varistor)! Sorry if I mind you! I’m looking forward to your answer or clues! I’ve read that article! It’s really really grateful! :-), Thank you very much! And may I ask you that which PWM Mode should be used in the project? 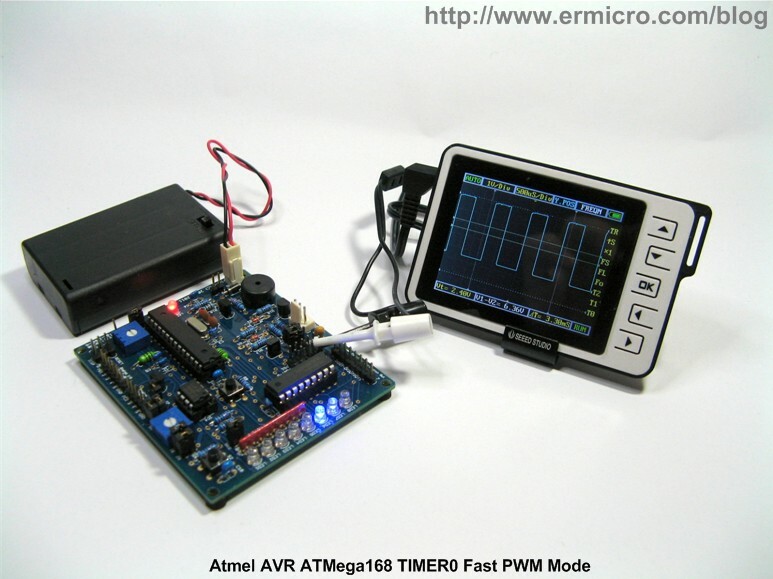 I’m using AVR ATmega8! You could use either fast or phase correct PWM mode. There is a big trade-off between better PWM resolution and higher PWM frequency. Thanks for the PWM instructions. This is because you can only send a constant to _delay_ms. However, it only produces a noisy ~300 hz sound and all 3 leds are on but not changing. Are there any other updates required? I didn't have the crystal in the diagram, so I have tried both without the crystal and using a 2Mhz xtal, both with the same result. The 10K pot on PC0 does not have any effect on sound or LED output. Since you used different crystal frequency, you need to adjust the code to suite the crystal frequency for the generated PWM. Thanks, I will try both. specified crystal and changing the code. What is the 10K pot on PC0 used for. I could not see this mentioned in the text or in the code. I purchased the correct crystal, but it still does not work. Maybe I need to set the clock source in the fuses. But I don’t know how to do this with AVR Studio 6. Can you please tell me how to set this? I searched the datasheet and the AVR Studio help file, but it seems like AVR Studio parameters are different than what is shown in the data sheet. I`m interested how did you write a song. I understand the part for chords, but i want to know how you manage with delays. “Try and Error”, and if you a music player then this stage will be shorter. 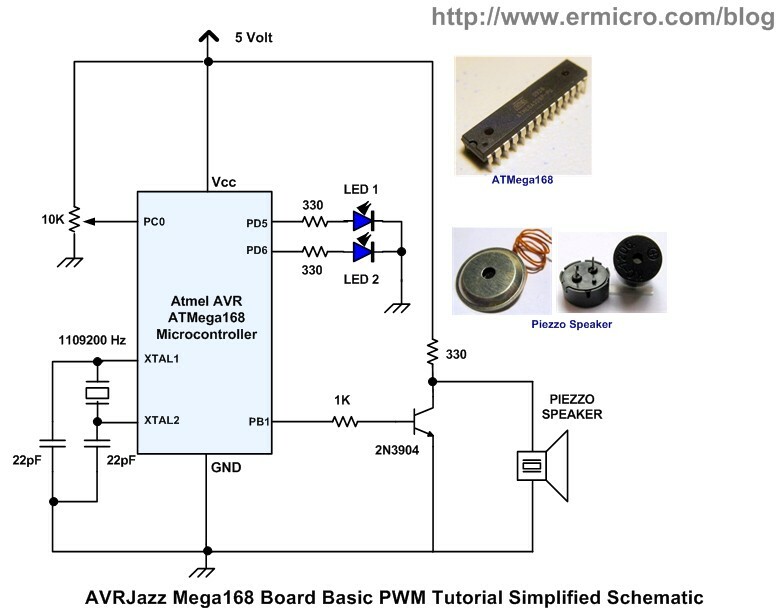 I want make mic for input -> lm 386 -> then I want read frequency and amplitude in atmega. What should I do or I modify?